Partly cloudy. Low 47F. Winds WSW at 10 to 15 mph.. Partly cloudy. Low 47F. Winds WSW at 10 to 15 mph. Despite the bite taken out of his catch by the taxman, this angler smiled broadly, perhaps because he was able to take stock of what he still had. A small bite out of a small fish is small. A small bite out of a 30-pound class yellowtail is actually quite a large bite. Taxes are due next week. It’s a hot take for those who didn’t realize that. As a taxpayer, I’m painfully aware of the reality taxes impose and pay them begrudgingly. As a public school teacher and member of the military, I’m painfully aware of my inherent dependency on those same taxes. Though I’m neither Republican nor Democrat and adamantly oppose the two-party system that has pitted our country against itself in a perpetual us-versus-them gridlock for half a century, I do share viewpoints from both sides of the aisle as a little “i” independent. My fiscal policy beliefs are simple: Taxes are a necessary evil, but managing those tax dollars responsibly is simply necessary. Without waxing political, widespread waste, fraud and abuse of tax dollars has led to a system in which we often struggle to see the direct, downstream value of the money we pour into the system. Instead, we tend only to notice the taxman taking a bite out of our hard-earned money. My worst encounter with the taxman came on the Willamette River several years ago. 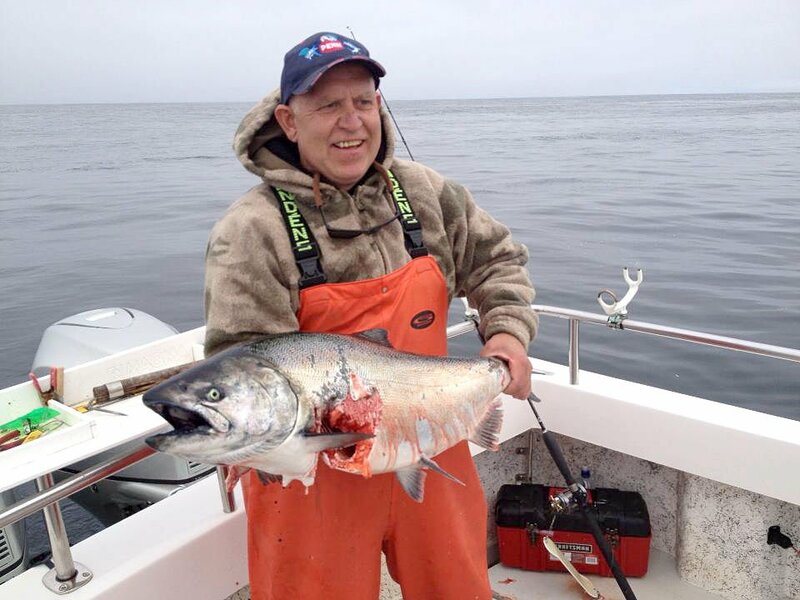 The taxman, embodied in a vicious sea lion hundreds of miles upriver from the ocean, grabbed the 20-plus-pound salmon I’d hooked as I tried in vain to reclaim my prize. I behaved in a fashion unbecoming of a grown man and brought shame on my family as I sobbed quietly with the realization that I’d lost my fish. It wasn’t pretty. It took 100% of my catch, but I got to see how that tax was utilized as the beast viciously ripped the salmon to shreds on the surface for several minutes while Lion King’s “Circle of Life” played softly in the background. Most of us aren’t simultaneously lucky and unlucky enough to see where our taxes go. I took for granted every fish I’d caught that hadn’t been stolen by the taxman up to that point, just as we may take for granted every public servant who does his or her job correctly. Every monument, museum and park that is clean and accessible. Both politicians who aren’t crooks. Yes, both. The second someone screws up, we notice. Perhaps money matters that much to us because we sacrifice so much to earn it. I once read, “We don’t pay for things with money; we pay for them with hours of lives,” and if we’re giving hours of our lives away for taxes, what do we get in return? Monthly payroll deductions aren’t my only experience with the taxman. Nor was that sea lion. I’ve seen a sea lion take a chunk out of a salmon in Humboldt Bay. It took mostly guts, but the salmon came to net maybe 5% lighter thanks to the bite of the taxman. I watched yet another sea lion (seeing a pattern here?) steal a massive yellowtail from a fellow angler on a charter boat in southern California. After the captain circled the boat several times, the deckhand was finally able to knock the fish out of the sea lion’s mouth with a gaff before using the same hook to bring the fish on board to the thrill of every person there. The bite out of the fish’s middle was a small price to pay, but it can be much steeper. I’ve lost sunfish to hungry bass, perch to ospreys, pelicans and grebes. I’ve even lost sturgeon to other anglers who, in their lack of experience, snagged the fish I’d already hooked and pulled harder with heavier gear. And speaking of snags, well, don’t get me started. It’s not all loss, though. You can beat the taxman from time to time. There was the day I reeled in a 3-foot lingcod just inches ahead of a incoming great white shark while fishing out of Newport as the rest of the boat watched, wide-eyed. As that fish clattered to the floor of the boat, a laurel was placed on my head and a trophy in my hand as flowers began to pile up at my feet. In reality, the taxman is not a vicious shark, a gluttonous sea lion, or a menacing bird. At least, not in spirit. We all know taxes are necessary for schools, roads, public safety, and a host of other social programs we rely on for civilization to function, including the management of public lands. Oregon’s 53% public lands are an embarrassment of riches, and most are managed by tax-funded agencies. So our money doesn’t go to waste if we actually use the services they provide. If you hate paying taxes, you’re not alone. If you hate tax refunds, you just might be. While some may hate tax season, I live for it because I know it can mean a hefty refund. For most American families, a tax refund means the largest infusion of cash each year. It can go to debt service, savings or, for me, recreation. You may not have a child to put into the public education system. You may not draw Social Security, Medicare or Medicaid. You may not understand how the national defense budget benefits you. But you can absolutely take advantage of our public lands. So while you figure out what to do with your refund, I’ll be maximizing my refund at every lake, river, stream and beach I can access in the 53% of our state that runs on hours of our lives but pays dividends to those who decide to invest just a few more. Fiscal policy is just so taxing. Read more at caughtovgard.com; Follow on Instagram and Fishbrain @lukeovgard; Contact luke.ovgard@gmail.com.